An airline is the best marketing arm a country can buy. In the absence of a strong national carrier we must open and make it attractive to other airlines to come into the country. Tourism is central and the key to make airlines operations viable. As an island Sri Lanka needs airlines to connect and keep up with the rest of the world. The airlines of today and tomorrow are much different than airlines of yesterday. The key to the future success include a solid business plan. Sales by volume, point to point service, fleet type, high utilisation and concentrated network targeting unserved and under- served markets. Some carriers use the geographical advantage of their location to funnel both short-and long-haul traffic through their hubs. Examples Emirates in West Asia and Copa Airlines in Latin America. These carriers have grown strongly in recent years and plan continued expansion in the coming decade. The Government should dismantle monopolies and promote competition among airport operators or pursue policies that incentivise airport monopolies to operate more efficiently according to the needs of their clients – the airlines. London is a great example of how places can benefit from increased competition. Since the BA’s airport monopoly ended, airlines have had a choice in London, which has six airports, each managed by a different operator. The right incentives play an important role. Monopolistic airlines do not work, neither do monopolistic airports. It’s time we stopped pretending that a lack of competition delivers anything but monopoly profit, let alone any sort of real cost reduction. Only competition has the power to reduce inefficiencies and deliver what the market needs at the right price. If the Government is serious about safeguarding mobility, it’s time we kill monopolies – before monopolies kill us. Low-cost airlines have democratised travel. It’s time airports did their part. Mobility – the movement of people and goods – is both a fundamental right and a linchpin of the global economy. But without air travel, it can’t happen. Making air travel accessible to all is therefore crucial, and airlines, airports, regulators, governments and relevant stakeholders have a duty to work together to make this a reality by making it affordable. Airlines have led the way in this, reducing the price of air fares since the year 2000 by being more efficient. This is due largely to improvements in aircraft technology as well as the rise of low-cost carriers (LCCs), especially in the Asia-Pacific. In fact, within ASEAN, budget airlines now account for more than half of total capacity, allowing many people to fly for the first time. Not everyone is playing their part, though. Airports remain islands of resistance while airlines and aircraft manufacturers worked hard over the past decade to get air fares down, airport cost per passenger rose by more than 35 per cent in the same period. Airports have also failed to realise that LCCs have different requirements from full-service carriers (FSCs). No-frills airlines need no-frills terminals for simple, fast and low-cost operations. Yet operators approach airport design with a “one size fits all” mentality. They fail to understand that not every hotel is the Hilton and not every car is a Rolls-Royce. There’s room for brands built on a volume proposition, such as Wal-Mart, Carrefour, and indeed LCCs. Competitive airports attract airlines​ and encourage additional capacity and routes.​ Better connectivity is good for attracting global companies, and countries with monopolistic airports stand to lose out to those with market-driven ones that can offer more destinations and higher frequencies. 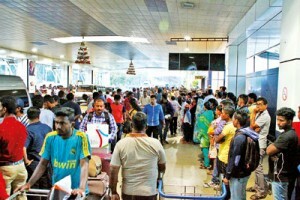 Sri Lanka needs to develop domestic and regional airports into business hubs. The country has 14 domestic airports. It is time we develop Ratmalana airport as an international airport for LCCs. Airports are also businesses and business needs to grow. The Government needs to promote regional airports. Develop new airports at required destinations to land smaller and medium size aircrafts (example A320 which is the most popular aircraft for regional operations) All these will help to strengthen its competitiveness in attracting tourism, business and leisure traveller.